​The epMotion 5070f is an automated pipetting system for cell culture applications allowing all of the benefits of automated pipetting to be available for liquid handling tasks inside a laminar flow or fume hood. Cell maintenance is one of the most repetitive tasks in life science research. 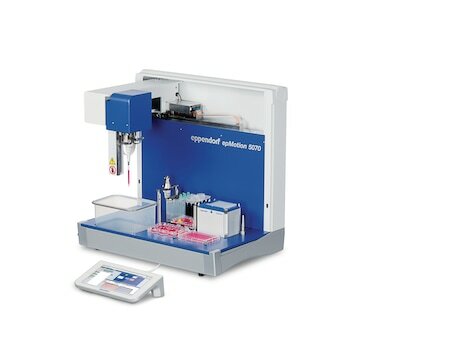 The epMotion 5070f allows you to automate key processes such as seeding cells, media changes, or performing cytotoxicity tests. It enables you to handle 6-, 24- or 48-well plates or even denser formats from 96 to 384 wells. Almost all single tube sizes such as cryotubes®, Eppendorf safe-lock and conical tubes up to 50 mL are supported.